This is the first game in the Mario series. For other games in the series see the Mario category. After tackling an ape named Donkey Kong, Shigeru Miyamoto had Mario hang up his hammer and pick up a plumber's wrench and take to the sewers. This is the first game that features Mario as the title character, and the first time we officially meet Mario's brother Luigi who, for the purposes of this game, is an identical palette swap of Mario. Rumor has it that Miyamoto was inspired by Joust and decided to make the game a simultaneous two player experience. This enabled players to make the choice to help or hinder their fellow player, and results in a lot of hilarity at times. After Coleco botched their relationship with Nintendo by infuriating Atari when they showed Donkey Kong running on the Adam computer during one CES show, Atari received uncontested rights for both the home cartridge and computer disk conversions of Mario Bros. They ported it to all of their systems, and planned for Atarisoft to release the game on a few other platforms, though none ever made it past prototype form, and thus never officially released. 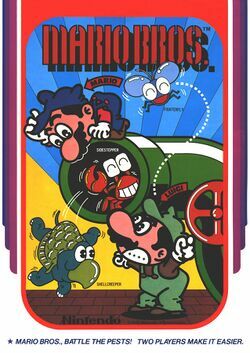 When Nintendo launched the Famicom in Japan, Mario Bros. was the sixth game made available, and it wasn't even a year old in the arcades yet, making the Famicom appear very hip to have such a recent arcade conversion. It was the fourth best selling Famicom game released during 1983 and 1984, selling approximately 1,630,000 copies in its lifetime. However the original Famicom version featured scaled down sprites that didn't mirror the arcade's precisely. Later on, Nintendo reprogrammed Mario Bros. for the Famicom Disk System, restoring much of the lost quality, and featured in game commercials for Nintendo games and Japanese food products. This conversion was also released in Europe as a cartridge, sans commercials. Since then, the game has been featured many times as an included mini-game, first in Super Mario Bros. 3 whenever two players attempt to occupy the same space on the map, and subsequently in every Super Mario Advance release for the Game Boy Advance. The sewer pipes are infested with pests, and it's up to Mario and Luigi to get rid of them. The pests are deadly if confronted head on, but the brothers can stop them in their tracks if they jump up and hit the pests from underneath in an effort to flip them on their backs. They must then jump up and kick the pests off the pipes before they manage to right themselves and continue marching around at an even faster pace. Mario and Luigi are paid by the pest, so be sure to collect the coins that appear when a pest is removed, but watch out for the blazing fireballs and the chilly icicle. You control Mario or Luigi with the joystick. Press the button to jump. You must eliminate every enemy to advance to the next stage. To eliminate an enemy, you must hit it from underneath until it flips over, then jump up and kick it off the pipe. You must avoid touching any enemy that is not flipped over, as well as fireballs, Slipice, and icicles. For every enemy that you kick off, a coin will pass through the stage. Collect it for bonus points. Use the POW block to create an earthquake that hits every enemy standing on a surface. In bonus rounds, collect all ten coins before time runs out for a bonus reward. This page was last edited on 10 February 2016, at 14:51. This page has been accessed 54,911 times.